Hans Pizka, because of his lifelong devotion to his art and his activities as ambassador through music, has been honored by the President of the Federal Republic of Austria with the honorary title of Professor. Hans is also associated with many performances of the Siegfried Long Call, and the photo was taken after one of his Long Call performances. Hans was born in 1942 in Metz, Lorraine, France, the eldest son of horn professor Erich Pizka. His family roots go deep into Bavaria's Suebia province near Fuessen and Memmingen which was part of Austria then, and his mother's side goes back to the early 12th century in St. Hubert near Kempen, not far from Cologne and Duesseldorf, next to Cleve and Xanten. It is interesting to note that Xanten is the site of Wagner's Siegfried, and also there is a Maria Stich on his father's side of the family in Upper Austria, from central Bohemia in the early 18th century, the same century in which Johann Wenzel Stich (Giovanni Punto) was born. Hans was educated at the Academic Gymnasium in Linz, Upper Austria, (a 450-year-old school) mainly by professors of the Jesuit tradition. A citizen of Austria, he speaks German, English, and Italian, understands and speaks other languages well enough to communicate (Spanish, some Japanese), and can read Greek and Thai (slowly). A scholar of history, he also can read the old-style Suetterlin German writings and the ancient French court writings of the 16th and 17th century. He began his musical education at age four on violin, and continued with viola and horn at age 9. His first horn teacher was his father, and later he continued his horn studies with Gottfried von Freiberg and Josef Veleba of the Vienna Philharmonic. His first public performance was at age 11, and he played his first horn concerto in front of a professional orchestra at 15. His orchestral career led him from Linz (Bruckner Orchestra), to Duesseldorf as successor to Gerd Seifert, and to Munich as successor to Norbert Hauptmann. He held the "Franz Strauss Chair" as the Bavarian State Opera Orchestra's principal horn in Munich from 1967 to 2007, and is called as an extra player or to fill in as first horn with the Vienna Philharmonic. He has played under conductors Karajan, Boehm, Kleiber, Sawallisch, Mehta, Ozawa, Muti, Abbado, Kubelik, Bernstein, and many others, and he has been a frequent soloist in countries all over the world. Hans has been a concert soloist, author of several important horn-related books (Mozart and the Horn, Hornist Dictionary 1986, and Wagner and the Horn), lecturer, horn designer, horn collector, publisher of horn-related music, producer of compact discs, and an expert regarding nearly everything connected with the horn. 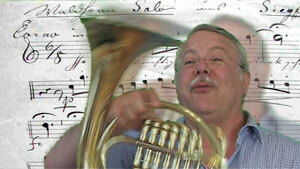 He has published about 500 titles of music, most for or with horns. He has started a horn-making business under his own brand name, producing double horns and Viennese Pumpenhorns. In 2002, Hans finished his sixth term on the Advisory Council (1982-95 and 1997-2002), having served the society in many capacities, including Vice President. He translated and published The Horn Call in German (Hornruf) from 1983-1994. Also in 2002, the IHS elected Hans an Honorary Member.